Lent 05: a much-needed celebration and pit-stop. The difference between Lent and a full-on 40-day fast is that one is a journey while the other is a discipline. One of the things I set out to do in my first Lent is to celebrate on Sundays and special occasions. And it’s been a while since I looked forward to Sunday as much as I have. It was like a much-needed pit-stop to celebrate the journey so far (however short) and to remind myself of the blessings that I’ve always enjoyed and taken for granted. For starters, I drank my usual cup of Nespresso coffee in the morning. Then for lunch, I ordered a ribeye steak ‘xtra cut at Aston’s and even drank teh peng jia C to my heart’s content. And for dinner, I tucked into Mummy’s homemade chicken rice, helped myself to a serving of young coconut juice and before the night is over, I’m sure I’ll be gobbling down some honey mangoes. There’s something beautiful about delayed gratification, especially in this microwave generation where everything is instant. I also took the opportunity to log in to Facebook and Instagram and realised that there’s really nothing important that I’ve missed, despite the 100+ notifications that were beckoning my attention. Lull time (periods of inactivity where nothing happens) is better utilised when you sieve out the distractions. But the most beautiful thing about today was the spiritual conversation that I had with Mummy in the late afternoon. She asked me all kinds of questions that young believers would ask. It felt like the Holy Spirit triggered her curiosity to learn about the things of her faith. I was energised by our interaction together and for the first time in her life, she actually said she would consider going to cell (to ask all these questions); she finally saw that there was another purpose for cell besides just sharing about her problems (which she is extremely reluctant to). Perhaps Apokalupto finally took place in her spiritual life. I am thankful. May God continue to fuel this spiritual hunger she has. As I gave thanks for our 元宵 dinner just now, I felt an intimate connection with God; it wasn’t just customary, but heartfelt. With that I greatly anticipate the week ahead. Over the weekend, I preached a sermon titled, “Shut Up and Get Out!”. 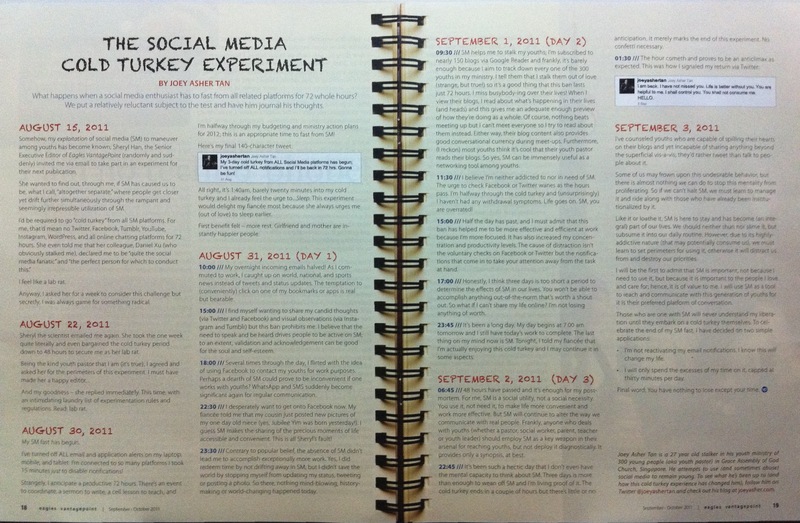 In it, I challenged R-AGE to embark on a social media cold turkey experiment like I did. The purpose of this was to eliminate audio and visual noise and distractions from their lives, so that they can enjoy the benefits of the discipline of silence and solitude, with the ultimate objective of hearing from God. I gave instructions on this absolute abstinence from all social media platforms including the obvious Facebook, Twitter, Tumblr, WordPress, Blogspot, YouTube, as well as Instagram and FourSquare. They had to disable email notifications from all these platforms too so that they won’t know what’s going on when they’re not logged in. I told them to tag or text me when they began so that I could cheer them on. The deadline that I gave was to accomplish this before 31 Dec 2011 and to journal their experience, as well as what they heard from God during those 72 hours. I was initially skeptical on the take-up rate, so I was pleased by surprising response. Immediately after I closed in prayer, I received an SMS from a youth who declared her fast immediately. Later in the evening, I received an SMS from a youth leader who told me that his two younger brothers and himself have commenced too and instead of a 72-hour fast, they will abstain from social media until the end of the year. 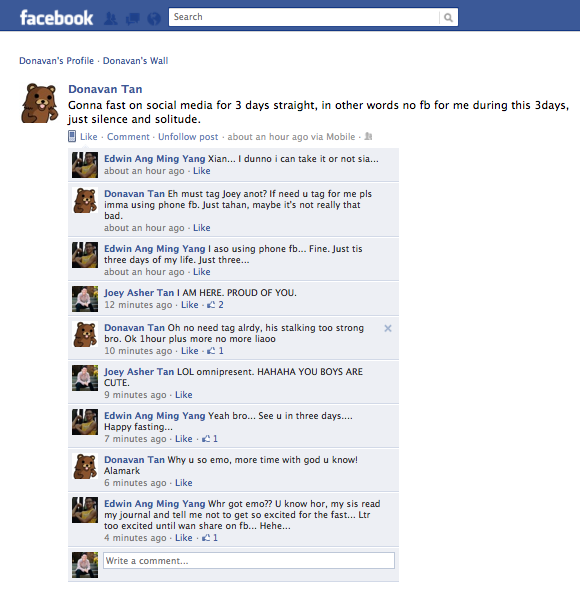 On Facebook, an entire youth cell group decided to fast together – I reckon it must have been their leaders’ initiative. I know a couple of other cells have also decided to go cold turkey together. I’ve also received a few other messages from a few more youths who decided to rise up to the challenge… One dialogue that really tickled me (screenshot pictured below) was a conversation between two 14-year-old boys. Above and beyond this experiment being an exercise of healthy conformism or making a cool statement, it is my sincere prayer that my young people will understand the power of solitude and how silence may help them to listen out for the still, small voice that Elijah heard in 1 Kings 19 amidst the chaos that surrounded him. God can manage situations where we thought our input was necessary. God can sharpen our observation and listening skills when we refrain from speaking. God can bring freshness and depth to our words when we finally say something. Oh, do remember to let me know if you plan to embark on a social media cold turkey experiment yourself after reading this… I’d love to cheer you on! I can almost guarantee success IF you stick to the abstinence absolutely! social media is altogether separate, and 72 photos. Micro-blogging has finally caught up with me. Or more like, I’ve finally caught up with micro-blogging. The combination of Tumblr and Instagram means that this blog has officially become a place for longer thoughts, deeper reflections and elaborated writing. In this day and age where everything seems to be fast-paced and instant, you no longer find the news but news finds you. Social media is revolutionising the way we communicate faster than we think it is (and can react to it). It’s only after I’ve activated my Tumblr that I realised how it innately encourages you to update. Micro-blogging is rampant because it allows you to re-blog, re-tweet and share what others have re-blogged, re-tweetted and shared. It feels as if fresh and original thoughts are sprouting all the time but the fact is that everything is just recycled and repackaged. There is nothing new under the sun indeed. And just when I thought WhatsApp had replaced SMS, Twitter came along and replaced instant messaging altogether. And just when I had gotten used to the convenience of posting photos to Twitter and FaceBook, Instagram came along to instantly take the place of photo-blogging. This affects the way we communicate to each other too and it’s happening at an alarming rate. I’m not a fan of how more and more (young) people say that they articulate their thoughts better over email and actually resort to it, but frankly, what can I do about it? Nothing. You and I have to learn to take it in our stride. This is becoming the generation of virtual relationships and honestly, we must fight it, but it’d be a grave error to reject it. Young people, be aware of its alienating ramifications and learn to have real vis-à-vis relationships. And parents, you’re the only ones losing out if you choose to remain a stubborn laggard in not wanting to connect with this generation in the way that they know how to. Online globalisation is pulling the world together but taking them apart at the same time. Isn’t it scary that we are becoming increasingly altogether separate? And isn’t it scarier that we are absolutely powerless to stop this from taking place? Sigh. no one would say it any better; Jesus > MOE. Her short testimony demonstrates the wisdom that she has gained over the years and proves the power of hindsight at the present – and how it provides insight of the past – and eventually foresight into the future. Today, only two out of the eight post-‘O’ level students in REAL 2011 were posted into their first choice. A part of me is clueless in dispensing advice, except in encouraging them to remain hopeful and trust in God; it has been more than a decade since I received my posting results, so it takes someone who’s current to the education system to encourage these students with conviction and credibility. I’ve always stated that Jesus > Grades in my sermons or on Facebook; I mean seriously, did you really think that a B or C could stop God’s will from unfolding in your life? Tonight, I’ll reiterate this point – Jesus > Posting; getting into your 2nd or 9th choice isn’t the end of God’s will for you – in fact, it’s PART of God’s will. Why am I so confident? I say this with such conviction because I know you’ll unravel the answers for yourself a couple of years later. The real question to ask is: can/do you trust Him? I can because Jesus > MOE and Jesus > Education. and here’s the full BBC transcript. A couple of hours before I turned 21 for the seventh time, I received a Facebook message from a correspondent in BBC. She googled Wayne Rooney related news and chanced upon my blog. And she asked if I was keen to be on the “World, Have Your Say” radio talk show. I didn’t ask for this and I thought it was a pretty cool birthday present from the Lord, so I agreed without blinking. And it wasn’t before long that I was on the line with the talk show host, awaiting my turn to speak. As a student, I was trained to talk on the radio, but nothing quite prepares you for your maiden experience, no less than on an international platform like BBC. Many things rushed through my head in the build-up to the programme and I was getting ready to regurgitate at least five minutes of continuous talking. As it turned out, based on the question that I was asked, I only managed to air about a tenth of what I had intended to share. At the end of my very short interview, I hung up with a sigh of disappointment. No, it wasn’t because I didn’t get enough time. And no, it wasn’t because I spoke poorly. It was simply because I didn’t get a chance to talk about Jesus Christ and about young people. I was disappointed with myself for that. I felt I had let the Lord down, and let my profession down. Hi Ros, thank you for having me on the show. Now, there aren’t many things that Wayne Rooney and I have in common except for the fact that we both belong to Gen-Y. Before we talk about his supposed motivations of money, which we speculate, let’s take a step back to examine the generation that he belongs to. Unlike Gen-X, or the baby-boomers, who pride themselves in staying loyal to an organisation and finds it an achievement if they can call themselves a one-company man, Gen-Y, or the Millennials, is a group of people born from 1982-1995 and are motivated by their own personal ambitions. It has become a common practice for people of this age group to change jobs frequently, not because they are fickle, but because they are ambitious and adventurous; they are achievement oriented and want to attain as many career landmarks in their lives. We must not forget that Wayne Rooney is just 24 years old – he’s about as old as my extremely capable younger sister! I think I can scarcely identify with Rooney because I am a Gen-Y in contact with Gen-Y everyday. I’m a youth minister with a Christian church in Singapore and for me to even be doing what I’m doing is proof of the characteristic Gen-Y attribute – to pursue your dreams; I’ve always had childhood dreams of being a youth pastor simply because of the way that I was brought up and the people who came into my life to invest in me. To be in the pastorate is something I’ve always wanted to do. Before I worked in church, I worked in the marketplace as a marketing manager with an imported wine company. To a lot of my peers, especially the older (Gen-X) ones, what I have done is career suicide, simply because I have swapped a relatively high-paying salary to take on this job and earn an amount that half of what I used to take home. There are initial struggles with the financial adjustments of course, but I’d gladly do it all over again, anytime, any day. Simply because I’ve always dreamed of being a youth pastor. That is why I think it wouldn’t be too far-fetched an idea to say that it’s for monetary factors that Rooney has decided to leave United. Even in his latest statements, we can pick up traces of ambition and pseudo-guaranteed success (or at least the platform to achieve it). On one hand, I won’t be surprised if Rooney cloaked his decision to leave United due to the recent controversies surround his private life – and I think if family is his priority, then good on him to move abroad to escape the vicious press in the UK – but on the other hand, I think it’s really because he’s an ambitious person. Maybe he’s doing a Ronaldo, where he’s won everything he could win in England and wants to move to greener pastures. Or maybe he simply wants a change of environment after being at United since he was a teenager. A lot of people will tell him many different things – some advice are born from personal financial gain (his agent, perhaps) and some would simply be for the sake of his family (Coleen, perhaps). I wouldn’t be surprised if Rooney’s father was against his decision to leave United because of the loyalty-stained blood he has as an older gentlemen. What I would tell Rooney, if I ever had the opportunity, is to listen to what his heart is telling him to do. I would love to say that he should listen to the voice of God, for that speaks louder and clearer than any other voice this world is offering – the only catch is that you have to first hear it! Unlike Rooney, who I assume isn’t a believer, I had an inner peace and an inner motivated that I’d like to believe is placed there by a divine being. With a supernatural backing, it was easy to go against the natural. I banked on God’s prompting in my heart and I made a decision based on a simple virtue that is uncommon in this world – obedience. I’m not sure what you would think about it – but honestly, it doesn’t matter – because we could go on and on about opinions; they will continue to differ and digress. Everyone has childhood dreams. For Mr Rooney, he wants to be constantly on a platform that would enable him continuous success; I don’t think it’s really about money and I wouldn’t be surprised if he ended up with a club that gave him a similar salary as what United offered. For you, Ros, maybe you’re already halfway through your childhood dream of being able to speak to a worldwide audience. For me, I am certain that what I am doing – and man! I absolutely love what I am doing! – and at this point of my life, I wouldn’t trade it for anything else. I consider it an immense privilege to be able to play a small part in influencing, inspiring, intervening and interceding for a generation. For I know that whatever that I am doing with them today will impact them in their tomorrows. It gives me great satisfaction that I’m investing my life in theirs, and to tell them how much God loves them, has a great plan for them, and then to play my part in believing in what God can do through them – wow, what an honour! It really gives a reward that the world could not offer. Thank you for having me on the show. I know that I’d never get to say all these things on air, but I thank you for giving me an opportunity to spill my heart in this setting, on my blog, as I always do. It is my prayer that this blog gives God full glory, for I am merely putting into words what He has put into my head. What a way to kick off my seventh 21st birthday. Be blessed, and be awesome. Cheers! I know I am supposed to sleep, but I just remembered that United is playing Bursaspor now! Of course I will give in to this temptation to watch a Rooney-less United in action! With or without Rooney, Ronaldo, Beckham, Cantona or the plethora of talents that have gone before them, United will continue to advance. If they have survived Busby, Best, Charlton and Law, they can survive anything! United we stand, divided we still stand and remain United! GGMU!